This book is why I love reading. It was gorgeous and gripping and everything I could want from a book. It was a rollercoaster of emotions and touched my own nostalgically melancholic and hopeful teenage heart. It’s the kind of book that makes you stop to think constantly and gives you a warm and fuzzy feeling at the same time. It deserves all the hype and all the awards and so much more. The story is set in the eighties and is told from the point of view of Aristotle (Ari for short) over the period of 1-2 years. Ari is a Mexican-American teenage boy, an introspective loner with some anger issues, who is suffering under the weight of his family’s secrets. Though he’s not a big talker, it was a joy seeing the story unfold from inside his head. His thoughts and musings were beautiful, both heartbreaking and hopeful at the same time . I think we can all relate to Ari to some degree. His thoughts certainly did speak to teenage me. But Ari’s life changes completely, the day he meets Dante. Dante is a soft-hearted artist who is confident about himself, always speaks his mind and is not afraid to show his emotions. It’s almost impossible not to love him. So the two strike up a friendship which changes both of them. Together they help eachother through the perils of growing up, dealing with family, work, sexuality and identity issues. Together they set about trying to discover the secrets of the universe, while the reader can come along for the ride and it is magnificent. Other than these 2 lovable characters, the writing style in this book is part of what makes it so very, very good. It’s a very rare style, written in a simple but still very poetic kind of way that just flows so well through the story. It felt a lot like stream of conciousness at times and I loved that so much. Also, the conversations between Ari and Dante (and actually all conversations with other characters as well) reminded me so much of some of my favorite movies: the Before Sunrise series. It was very similar in the way that there is not that much of a plot other than people talking and spending time together, but it gave me the same feelings and emotions and just overall warm fuzziness in my heart. Also, while the main theme is of course the friendship between the two boys and the evolution of that friendship, another important theme is family. I loved all family scenes in this book and I loved that each boy’s family was so very present in their lives. Yes, they are flawed and they have their issues, but they are there. Especially watching the dynamics of Ari’s family and the effect it had on him was wonderful. I can’t recommend this book enough. If you have not yet read it, please do. I’m kicking myself for not picking it up sooner. It was an amazing book that deserves all the praise it can get and the only thing I didn’t like about it was how it ended too soon. But then I heard a sequel is in the works, so that is the most amazing news ever, because I am so ready to have some more Ari and Dante in my life. 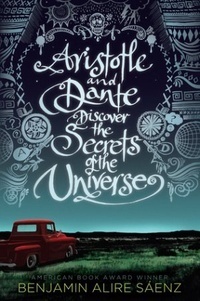 Have you read Aristotle and Dante Discover the Secrets of the Universe? What did you think ABOUT IT?